When I was a boy, my step father ordered “I Love Lucy” on VHS through the Time/Life series. Each tape contained two episodes, I think, and the first one was the famous chocolate factory episode where Lucy and Ethel can’t keep up with the speed of the chocolate conveyor belt. It was hilarious and we watched it over and over again. 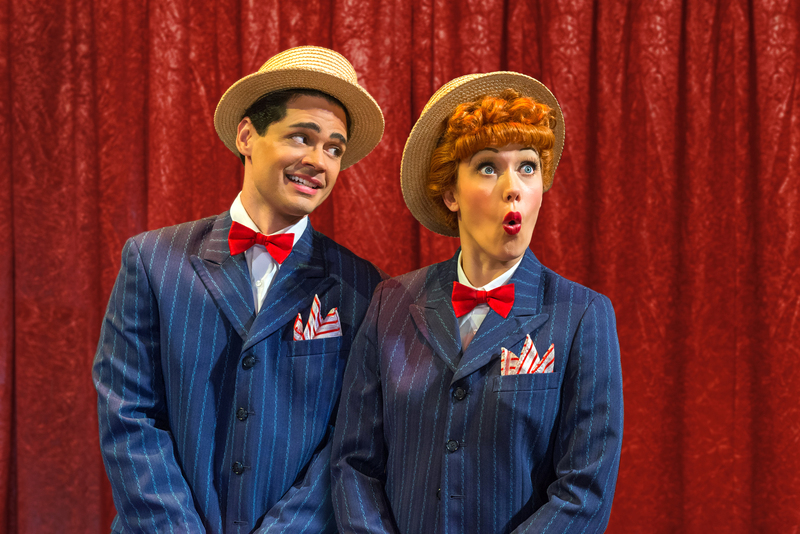 I LOVE LUCY – LIVE ON STAGE presented as part of the Broadway Across America series at the Aronoff Center doesn’t have any moments that raucous but it is a fun night out at the theatre. Especially if you fit within a certain demographic. I’m not it. My 20 year old friend was even less so. But its good enough and the grey-haired patrons around us were definitely digging the experience. The premise – and its a good one – is that we’re at a live taping of two episodes of the “I Love Lucy” show. There are commercial jingles before, during, and after from the era and a cute audience participation bit that works best when the characters interact with modern day. In our case, that was a tall, alternatively dressed professional piercer. The final dance number rounds out this quasi-musical with style. While the show never wows, its also not going to offend. Lucy, played by Thea Brooks, is funny and charming and a terrific dancer. Desi, played by Euriamis Losada, is as charming as the original and does a terrific impersonation. Other standouts include Denise Moses, Cindy Sciacca, and Mark Christopher Tracy. While not for everyone, if you too Love Lucy, then this might be the show for you. It runs through June 14th. Click here for more information and tickets for I LOVE LUCY – LIVE ON STAGE.